Dark Chocolate Guinness Pretzel Truffles ~ Learn, Live, and Explore! Still trying to find good uses for my 6-pack of Guinness I got at the grocery store last week, I turned to my absolute favorite baking site: Sprinklebakes! And she didn't let me down. Once I saw the gorgeous photos of her Guinness Pretzel Truffles, I was intrigued. Plus, I've been sharing a lot of my recent baking projects with my coworkers, so small bites are perfect to transport to the office. Pour 1/4 cup plus 2 Tablespoons Guinness in a small saucepan. Set aside. Pour the remaining Guinness in a separate small saucepan and bring to a simmer. Cook until the Guinness is reduced to around 1 Tablespoon, approximately 15-20 minutes, being careful to not let it burn when the liquid is nearly reduced. Pour into a small bowl. Put the chopped chocolate in the saucepan with the 1/4 cup + 2 Tbsp Guinness and turn on the burner to medium-low. Leave the chocolate alone until it starts to melt, then start to stir slowly with a wire whisk until the chocolate is smooth. Add the butter - 1 Tbsp at a time - to the melted, smooth chocolate and whisk gently until all of the butter is melted and incorporated. Add the 1 Tbsp reduced Guinness and stir, then add the pulverized pretzels and stir in completely. Pour the chocolate truffle mixture into a bowl and refrigerate until firm or overnight. Line a cookie sheet with wax paper. 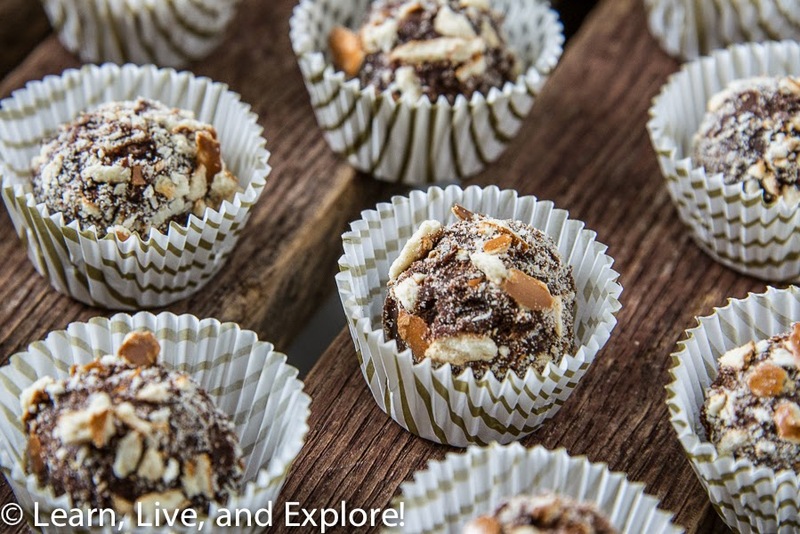 Scoop out the truffle mixture and make 1 inch balls, rolling in your hands, and place on the wax paper. Chill the truffles in an air-tight container until ready to roll in the crushed pretzels. Wait to do this as the last step so that the exterior pretzels are at their crunchiest!